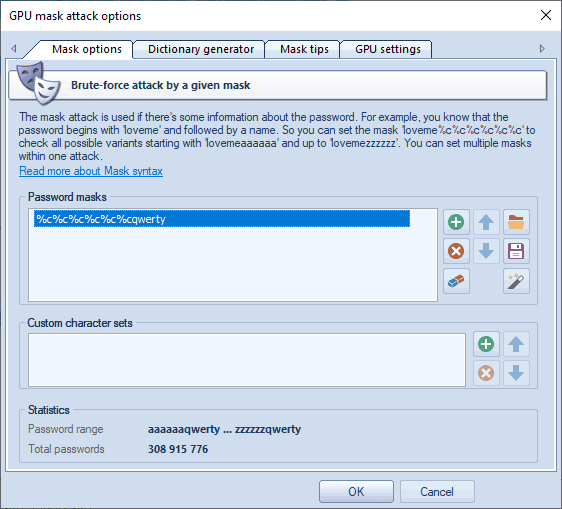 GPU mask attack is an irreplaceable tool when you know a part of the password or have any specific details about it. For example, when you know that the password consists of 12 characters and ends with the qwerty, it is obvious that searching the entire 12-character range of passwords is unreasonable (and useless, for it takes ages to complete). All that would be required in this case is to guess the first 6 characters of the sought password. That is what the mask attack is for. In our case, we could define the following mask: ilove%C%c%c%c%c%c. That means that the program would successively check the following combinations: iloveAaaaaa, iloveAaaaab .. iloveZzzzzz. If the original password is 'iloveMarrie', it perfectly fits the range. The mask input field is used for setting the rule, which will be used by the program to guess the password. If the mask is set correctly, below you will see the range of characters generated by the mask. User-defined masks can be saved to disk. 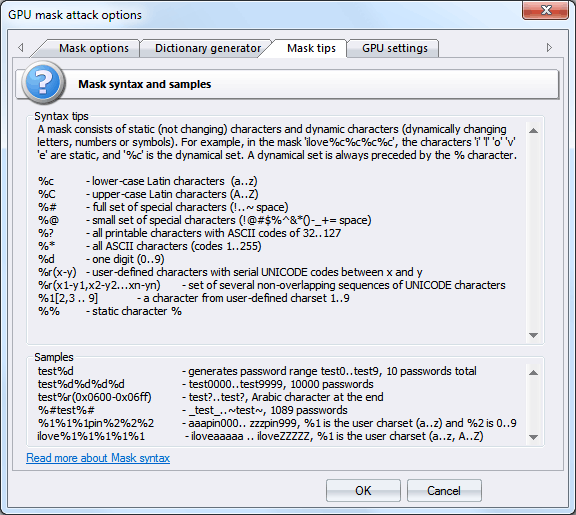 The third tab of the mask options contains a short description of the mask syntax and a couple of examples. The mask syntax is pretty simple and consists of static (unmodifiable) and dynamic (modifiable) characters. Dynamic characters always have a leading %. 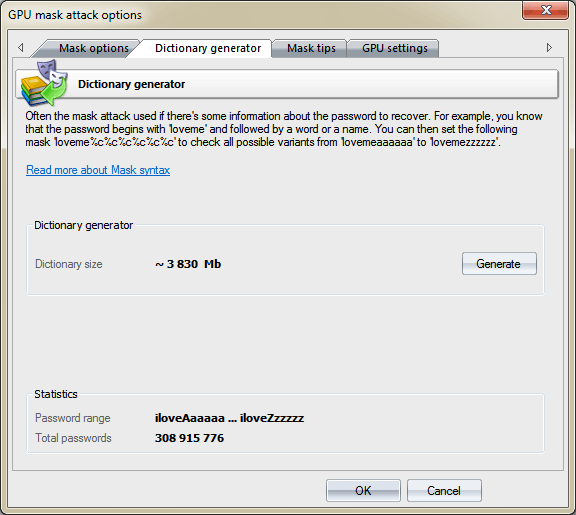 For example, if you set the mask secret%d%d%d%d, the program will generate 10000 passwords (secret0000, secret0001, secret0002 .. secret9999). GPU configuration is pretty simple and consists of only one parameter: the number of thread blocks to run on GPU. Each block consists of either 128 or 256 threads. Thus, if you set the number of blocks, for example, 10000, the GPU will run 10000*256=2560000 threads. 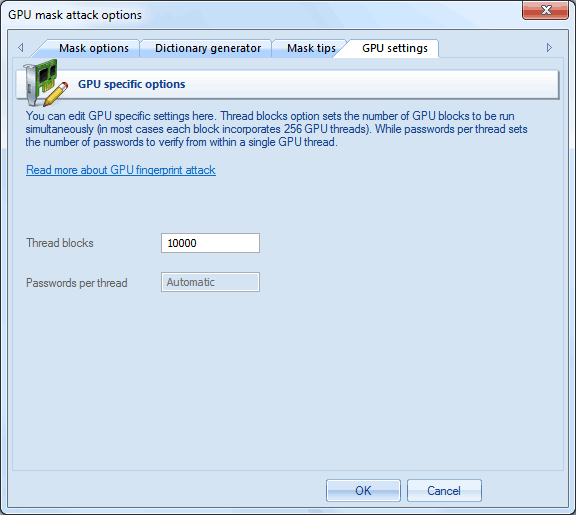 Each GPU thread can check multiple passwords. The total number of checked passwords greatly depends on other options. Setting the ThreadBlocks parameter smaller than 10000 on modern graphics cards, in the majority of cases, leads to poor performance. To avoid performance degradation, after setting up the parameter and running the attack, make sure the GPU load chart has close to 100% plain graphic without peeks. See the screenshot of NVidia GTX 750Ti running at 15000 blocks.